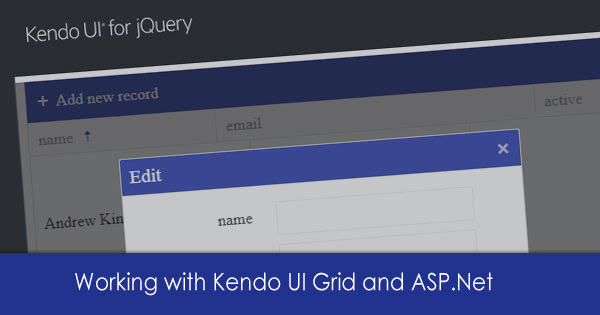 Kendo UI Grid is a very popular widget for visualizing data tables. And in this example will demonstrate how to get CRUD(create/read/update/destroy) operations to work with ASP.Net(C#) Web Method. Let's start by creating a Member class that will handle reading a list of members with server paging/sorting, plus updating/deleting one. It does a very simple validation on Member email as an example of server-side validation. For simplicity, will read members from a static list instead of querying a database. Now, let's have a look on the Web Method in Grid.aspx.cs that will handle all the CRUD operations. Need to set type of AJAX query to "POST" and the contentType of the request to "application/json; charset=utf-8". Using parameterMap function that will create request Params object to work with Asp.Net Web Method. On requestEnd, need to reload the Grid to insert the newly created/updated record in the right page. On error, we need to prevent the edit popup from closing, we must prevent the next dataBinding event. Using parse function, to remove the "d" wrapper in JSON response from ASP.Net web method.